It is not for anything that spinach was the muscular Popeye’s preferred nutrition when fighting an adversary. The green leaves definitely pack in more nutrients and very few calories (that seems to be a no-brainer, they are green leaves!). Research has hailed this green for helping keep everything from cancer, asthma to lifestyle disorders at bay. 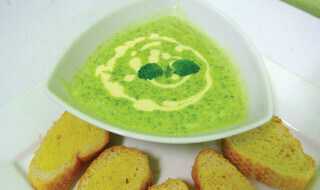 What’s better, the spinach is combined in a soup that has silken texture. Slurp away for an eating experience. 1 Bunches spinach, washed, chopped, blanched, cooled and pureed. Melt the butter in a pan on low heat and add the flour to it. Stir well until the flour is fragrant and very lightly browned. Pour in the milk, stirring well and constantly to make sure it does not form lumps. Keep cooking, stirring and adding the milk till you have a lovely, silky white sauce. Into this mixture, kindly fold in the spinach and cook it all some more. Shred cheese on top, and be generous with the freshly crushed black pepper. that’s it.